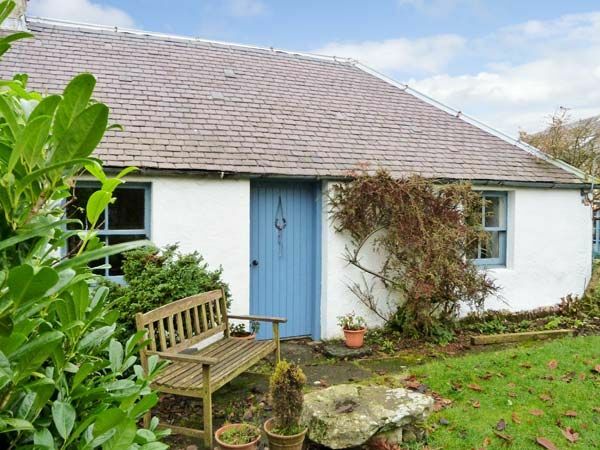 Gateside Farm Cottage is located on the owners' farm in the area of Fossoway near to Kinross. The cottage is all on the ground floor and sleeps two people with one double bedroom, a bathroom and an open plan living area with a fitted kitchen, dining area and a sitting area with a woodburner. Outside the cottage is off road parking for two cars and shared use of the owners' garden. Ideal for discovering this beautiful part of Scotland, Gateside Farm Cottage is a lovely holiday cottage for a couple. Amenities: Electric heating with woodburner in sitting room and underfloor heating in bathroom. Electric oven and hob, microwave, fridge/freezer, TV with Freeview, DVD, selection of books and DVDs. Fuel, power and starter pack of fuel for woodburner inc. in rent. Bed linen and towels inc. in rent. Travel cot available. Off road parking for 2 cars. Bike storage. Shared lawned garden with furniture. One well-behaved dog welcome. Sorry, no smoking. Shop and pub 2 miles. Note: There is a short walk to the property from the parking area. Note: Dogs must be kept on a lead when outside the cottage. Note: Use of a car is necessary when staying at this cottage as the nearest bus stop is two miles away. Town: Fossoway comprises the villages of Carnbo, Crook of Devon, Drum, Rumbling Bridge, Powmill and Blairingone. Nearby is Loch Leven and further afield is the city of Edinburgh. All ground floor. One king-size double bedroom. Bathroom with bath with shower attachment, basin and WC. Open plan living area with fitted kitchen, dining area and sitting area with woodburner. Electric heating with woodburner in sitting room and underfloor heating in bathroom. Electric oven and hob, microwave, fridge/freezer, TV with Freeview, DVD, selection of books and DVDs. Fuel, power and starter pack of fuel for woodburner inc. in rent. Bed linen and towels inc. in rent. Travel cot available. Off road parking for 2 cars. Bike storage. Shared lawned garden with furniture. One well-behaved dog welcome. Sorry, no smoking. Shop and pub 2 miles. Note: There is a short walk to the property from the parking area. Note: Dogs must be kept on a lead when outside the cottage. Note: Use of a car is necessary when staying at this cottage as the nearest bus stop is two miles away.